Goto IM-Notify site in your web browser and click on ‘free trial’ link. 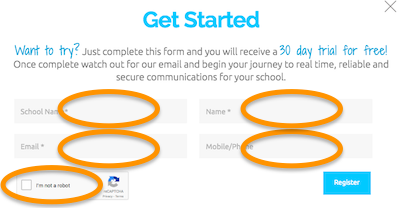 Fill in the form with your school name, your name (as the administrator), and your email address (please ensure this is valid and not a heavily filtered address) so that the system can end you your access information. Optionally put in your mobile phone number, please include the country code if you are not in Australia. Including your mobile phone will enable you to use the mobile app. Tick the ‘I’m not a robot’ and answer any challenge question. Click on the blue Register button. Within moments you should receive an email at the address you have entered containing welcome information and a one time link to access the administration portal. Click on the link. Once you have clicked on the link, enter your desired password. You will then be prompted to input people you would like to be part of the IM-Notify team. These people will receive and invitation email from the system and the important information for them to join. Enjoy the world of IM-Notify!